After two weeks with my new Slate , I thought you might like to hear about some of its strengths and weaknesses. 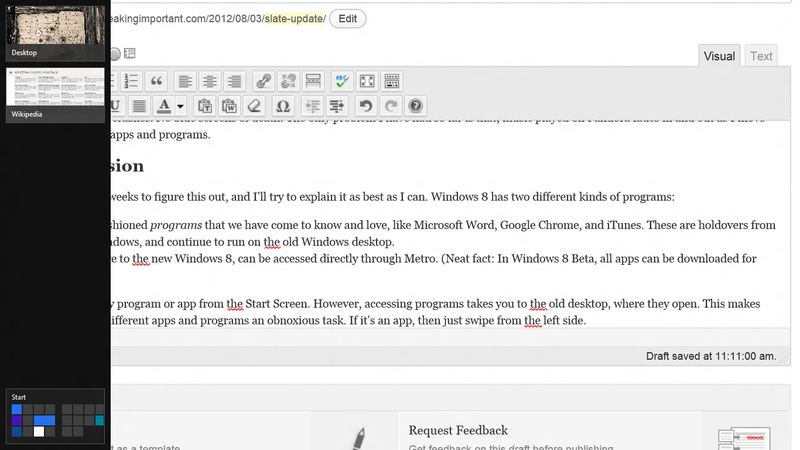 Overall, I would dare say that I find Windows 8 Slate to be a powerful tool with great potential. It seems reliable, though somewhat confusing to use. Here is my Windows 8 Start Screen. The tiles are nice and big. Note the large blue weather tile will tell you the temperature outside. However, most tiles are for links to old legacy programs that don’t have fancy graphics to take full advantage of this feature. 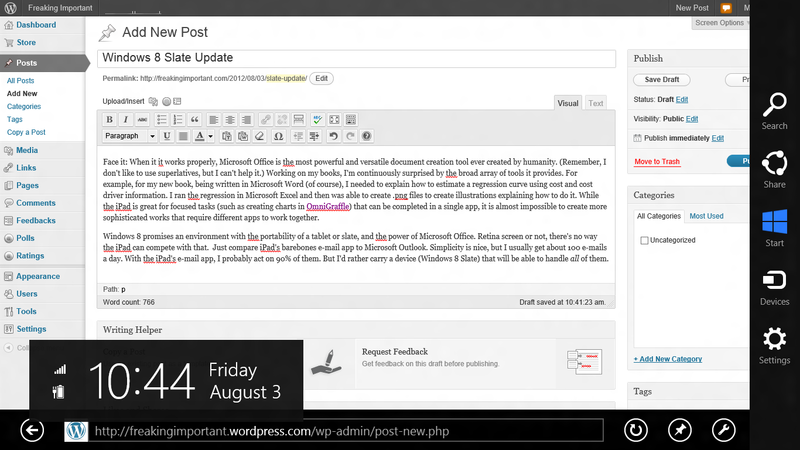 Note the intrusive Outlook notification on the upper-right. I love my iPad but there’s no way around it: Windows 8 Slate is the way of the future. It will crush the iPad the same way Windows once crushed the Macintosh. Here’s why: Windows 8’s ambitious goal is to create a new and universal environment for all devices. Think about that megalomania for a second: One universal environment for all devices. While Mac OS and iOS are beginning to look more and more similar, and work better together than they used to, face it: they are different. They need to be synced. Furthermore, as great as the retina displays are, iOS has issues. File Management in iOS is a nightmare, and different apps lack the ability to share files and other information. While there is a great deal of conformity between apps, there are also many inconsistencies. For example, some apps can create PDF files, some can’t. Some can open PDF files, some can’t. Some can store PDF files, and some can save them, while others can’t. A power user is often stuck juggling files between different apps, trying to figure out how to get a job done. Designed as a smartphone system to compete with the BlackBerry, when it faces off against a fully functioning PC for more complex creative tasks, iOS is way out of its league. Microsoft’s approach here is to start all over, creating a new interface that will work everywhere. The Windows 8 Start Screen, made up in Windows 8 Style (which used to be called “Metro,” a much cooler name) works everywhere and is significantly more flexible than iOS, but easier to manage on portable devices than Mac OS could ever be. 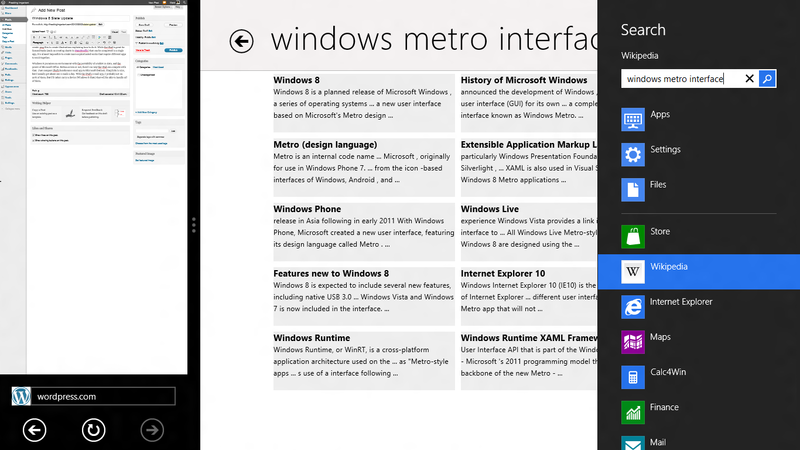 The Windows 8 Start Screen has a big leg up on iOS: Its tiles are larger than iOS icons. This makes them easier to see and touch with your finger. Furthermore, these tiles themselves can provide information, like the weather, news headlines, or pictures that you like. Windows 8 wastes less screen space with pretty wallpapers, instead providing larger and more informative icons. Swipe from the right, and this cute little menu peeks out of the right side of the screen. As an added bonus, Windows 8 tells you the time. No matter what app you’re in, no matter what kind of device, just swipe from the right margin, and these commands arrive ready, willing, and able to serve you. Wow. Want to print? Whatever app you’re in, swipe from the right, select “devices,” choose your printer and go. Swipe from the bottom to get commands to manage your app. Here in Internet Explorer, swiping from the bottom gives you an address/search box, and access to many other internet tools. Swipe from the leftto move between apps. The screen will accommodate two apps at a time, one occupying about 20% of the screen, the other occupying 80%. This gives you the classic advantage of multitasking: being able to view two documents or apps at once. However, the 20% application is often too small to see clearly. 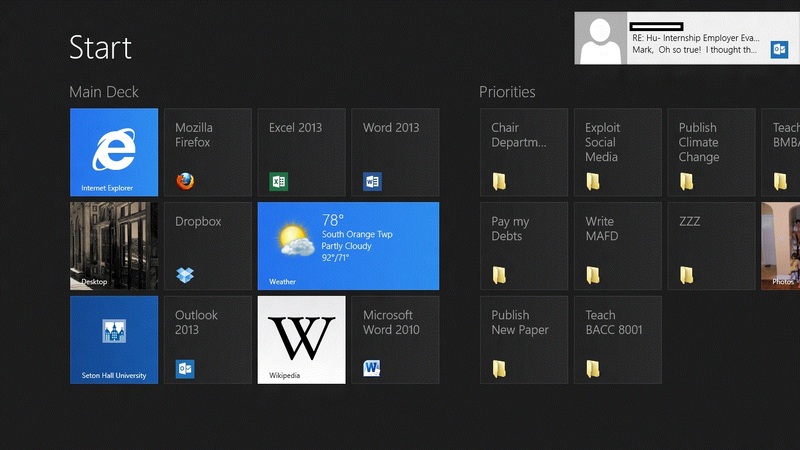 When swiping left, all open apps appear, including the desktop, where you’ll find open pre-Windows-8 programs. The screen is split 80/20. On the left 20% is this blog, which is so small that you can’t see anything. On the right is a Wikipedia artlce I was looking up. From the Wikipedia app, I swiped from the right side to get that black search menu. Swipe all the way down the screen to close an app. Once you figure it out, simple and elegant swipes work universally on any app running on any device (PC, slate, surface, smartphone, etc.). Face it: When it it works properly, Microsoft Office is the most powerful and versatile document creation tool ever created by humanity. Working on my books, I’m continuously surprised by the broad array of tools it provides. For example, for my new book, being written in Microsoft Word (of course), I needed to explain how to estimate a regression curve using cost and cost driver information. I ran the regression in Microsoft Excel and then was able to create .png files to create illustrations explaining how to do it. While the iPad is great for focused tasks (such as creating charts in OmniGraffle) that can you can complete with a single app, you would have a really hard time creating more sophisticated works that require different apps to work together. Windows 8 promises an environment that combines the portability of a tablet or slate, with the power of Microsoft Office. Retina screen or not, there’s no way the iPad can compete with that. Just compare iPad’s barebones e-mail app to Microsoft Outlook. Simplicity is nice, and great for checking e-mail when I get a minute between phone calls. However, I usually get about 100 e-mails a day. With the iPad’s e-mail app, I can probably act on about 90% of them. But I’d rather carry a device (Windows 8 Slate) that will be able to handle allof them. For that I need something like Outlook, with e-mail, tasks, scheduling, and contacts, and access to a complete file management system. Same goes for Microsoft Word versus Apple’s Pages, or Microsoft Access versus, er, I don’t think Apple offers an iPad database management program. In short, Windows 8 promises extraordinary potential and power. Real old-fashioned legacy programs, like Microsoft Word, Google Chrome, and iTunes. These holdovers from old Windows continue to run on an old Windows desktop. You can access any legacy program or app from the Start Page. However, accessing legacy programs takes you to the old desktop, where they open. This makes shifting between different apps and legacy programs an obnoxious task. If you want to go to an app, then just swipe from the left side. However, if you’re going to a legacy program, then swipe from the left to get to the desktop. Then go to the Windows taskbar at the bottom of the desktop to select your legacy program. Want to know which Internet Explorer sites are open? Then swipe-from-the-top. Windows 8, however, has apps and programs flying around from all different different directions. It can take some frustrating swiping and clicking to find whatever you’re looking for. Occasionally, you even come across different apps and programs that you thought were closed, but are actually still open. I hope that all this swiping and clicking gets fixed before the full release. However, the Office 2013 Preview Edition, which should, in theory, take advantage of all of the bells and whistles that Windows 8 offers, opens up as a legacy program, rather than as an app. This is not an auspicious sign. I’ve downloaded and tried out a number of other apps. They are reliable and look good, but often lack basic features – most likely because of their beta status. Should you buy a new iPad? Sell your Apple stock? Buy Microsoft? Buy a Windows 7 PC? I’m just a blogger, and you shouldn’t make investment or PC decisions based on what an unknown-blogger-like-myself says. That said, I believe that loyal Mac and iPad geeks, like my friend Dan over at dignuggetville, have good reason to be very very scared.